Stockholm is one of those cities that you can walk around and with our Free Tours Stockholm in ENGLISH you will know parts of Swedish history and culture in a very short time. I would like to tell you what you can see in Stockholm in 2 or 3 days and what you should not miss it if you plan to visit the city. The Stadshuset is one of the most famous buildings in Sweden, and one of the most visited tourist attractions in the capital. Famous for its great ceremonial halls and unique pieces of art. The City Hall hosts 1,300 people each year (including the Swedish royal family) during the Nobel Awards banquet, held every December 10th. The Town Hall Tower is open to the public during the summer months, and from there you can get one of the most impressive views of the city. 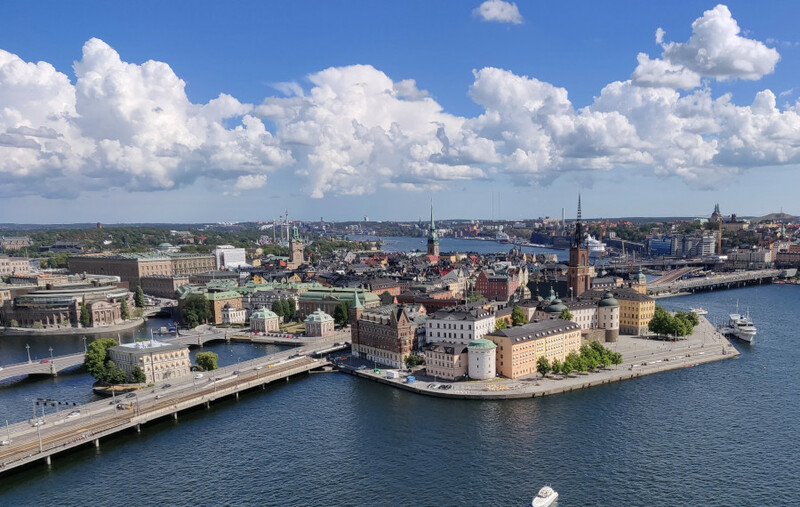 Take a look at our blog if you want to know more about where to take The best pictures of Stockholm and enjoy the most beautiful views of the city. The Vasa is the most visited museum in Scandinavia. It was built and opened in 1990 to preserve the remains found from the XVIth century Vasa warship. Built between 1626 and 1628 as “the most powerful warship” by order of Gustave Adolph II, the ship had to withstand both the onslaught of enemies and weather conditions. But something did not work out as expected, and the ship went down a few 100 meters from leaving the port of Stockholm on the day of its inauguration. More than 300 years later, the ship has been discovered, refloated and rebuilt, not without little effort on the part of the specialists, and is exhibited today in the museum along with the thousands of objects that were recovered, among which dishes were found, board games, and the remains of the crew members who sank with the ship. Literally translated as “Old City”, Gamla Stan is probably the most charming place in Stockholm. The old town is nothing less than the place where the Swedish capital was founded in 1252, and therefore a site with more than 700 years of stories, dark legends and curious facts. Home to emblematic buildings such as the Royal Palace and the Cathedral of Stockholm, it is one of the largest and best preserved medieval centers in Europe, where you will also find handicraft shops, cafes and unique restaurants housed in dark cellars destined in the past for less purposes. If you are like me and you like to try new things, you should not leave without having visited the market of supplies in the city. In this case I propose not one, but two! Hötorget is the name of the square that is right in front of the Stockholm Concert Hall (Konserthuset). The blue building, decorated with sculptures from the renowned Carl Milles, is where the Nobel Prizes for Literature, Physics, Chemistry, and Medicine are awarded every December 10th. Here you can find a market that is mounted every day in the square with flowers, fruits, and various products, and another called “Hötorgshallen” that is located below the movie theater. In the latter, you will find an assortment of Swedish and other products from different parts of Europe, bars, and restaurants and one of the few shops where you can buy alcohol (Systembolaget). Hötorgshallen is open from Monday to Thursday from 10 am to 6 pm, Friday from 10 am to 7 pm. and Saturdays from 10 am to 4 pm. Östermalms Saluhall is much more than a market, it offers quality products and typical Swedish and international dishes since 1888. Due to its particular characteristics, the Saluhall building is part of the Cultural and Historical Heritage of the City of Stockholm. And although it is currently in renovation, it is expected that its reopening will be mid-year 2019. Aware that the process would involve a long period of time, all the restaurants and stores of the original building have been relocated in a provisional adjournment that is across the street. In this way, today we can continue enjoying everything that Saluhall has to offer, vegetables, meats or traditional sausages such as bear, moose, reindeer or deer meat. Undoubtedly, it is the ideal place to discover a little more about Swedish gastronomy. The market is open from Monday to Friday from 9:30 a.m. to 7 p.m., and on Saturdays from 9:30 p.m. to 5 p.m. The Island of Södermalm is ideal for a walk in the afternoon. There you will find bars, shops and the most charming cafes. Taking a fika in a coffee shop in the area is probably the best recommendation I can make. “what is a fika”? If you do not know what I’m talking about, you should read our article dedicated to Swedish FIKA. Great overview about the city! Thank you!